Medicine Buddha is a Buddhist deity associated with the health and well-being of ourselves and others. During this practice, we make heartfelt prayers that everyone will be healed of all suffering and sickness. Medicine Buddha is one of many Buddhas who have attained the state of perfect enlightenment for the benefit of all sentient beings. The enlightened mind has eliminated all negativity and perfected all positive qualities. 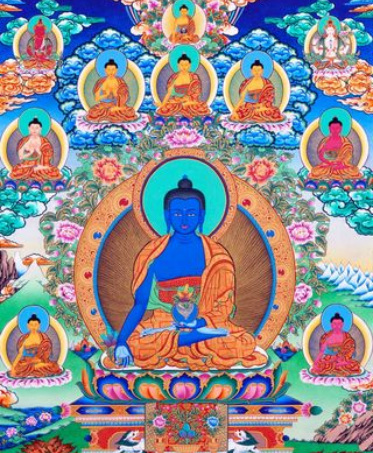 Medicine Buddha's blue-colored body signifies omniscient wisdom and compassion as vast as limitless space and is particularly associated with healing both mental and physical suffering. Making a connection with him, practicing meditation, reciting his mantra or even just saying his name helps us achieve our potential for ultimate healing.